Joe and Marylee Dobbes were amateur winemakers for a number of years before planting their 20+ acre vineyard in 1982-84. In the 1980’s their vineyard, located in the East Willamette Valley Cascade foothills near Marquam, was a bit out of the way. Most vineyards at the time were located on the west side of the Willamette Valley. Their first commercial vintage was 1987.The tasting room was surrounded by vineyards and overlooked an 8-acre lake. The Dobbes are parents of well-known Oregon winemaker Joe Dobbes, Jr.
Marquam Hill was located at 35803 S. Highway 213, Molalla, Oregon 97038. 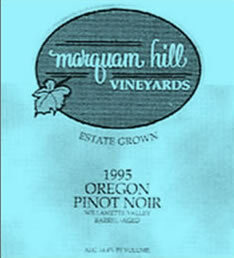 The Dobbes retired and sold Marquam Hill to Alexeli Winery in 2008.